Celebration Place is the approved children’s curriculum for Celebrate Recovery ministries for children ages 5-13 years of age. This Christ-centered curriculum mirrors the lessons taught in Large Group for adults. We refer to it as our “Pre-Covery” program. We strive to partner with parents to help break the cycle of dysfunction destroying so many of our families. The primary purpose of Free Play is to offer children an opportunity to build friendships. Free play at the beginning of each night allows children to transition from the business of the day into Celebration Place. Worship is important because it helps children connect with God. Children learn we show our love to God through praise and worship. During teaching time leaders presents recovery principles and Biblical truths in ways children can understand. 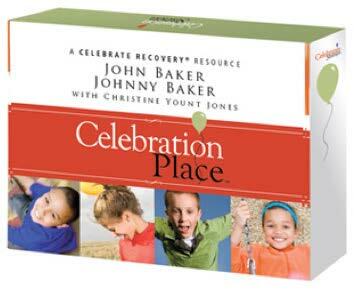 As leaders in Celebration Place, we get to partner with parents in teaching children the principles of recovery. Using the journal page, we help children identify their feelings and the reason why they feel the way they do. As children learn to identify and talk about their feelings they become better able to connect with others, reducing feelings of isolation. Small groups give children a chance to share their prayer requests and to pray for each other. In our centers, children learn how to apply the principles taught during the main lesson. A Center might be a game, activity, or craft to help children experience a main point of the lesson. This keeps the night fun and the children engaged. In the closing leaders reiterate the main points of the lesson and familiarizes children with the Serenity Prayer by reciting a version of it. Through Celebration Place, children experience the love of Jesus as they learn how to love themselves and others while they grow in their own relationship with God. They also learn healthy coping skills for life’s tough issues.